It doesn’t seem that long ago I was asked to write a quick review of 2013, but it’s that time of year again when I look back on what we’ve been up to and let you know some of what next year has in store. It’s been another marvellous year to be part of Thornbridge, particularly with plenty more awards coming our way. It started in February with 4 medals at the Dublin Craft Beer Cup. April gave us a silver medal for Wild Swan at the World Beer Cup, while our Kölsch won a gold medal at the International Beer Challenge and yet again picked up ‘World’s Best Kölsch’ at the World Beer Awards. 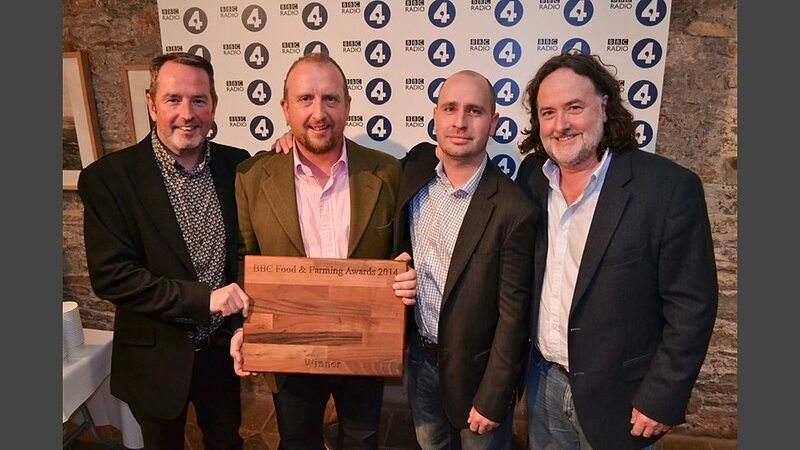 June saw us win the Best Drinks Producer Award 2014 at the BBC Food and Farming Awards, which was a great award to win as it recognised Thornbridge’s ethos as well as the beer. However, in September, we were particularly pleased to win ‘Beer of the Festival’ at a reinvigorated Sheffield CAMRA Beer Festival. Some ‘Great Taste’ triple stars for Jaipur and our Weizenbock, Otto, round off what has been another amazing annual haul of awards of which we can all be very proud. This year has seen an expansion of our barrel ageing projects. Our first batch of Sour Brown was 18 nervous months in the making up at the hall brewery. We were delighted with how it came out, but we only made a small amount and due to interest sold very quickly, so we decided to brew a large batch at the Riverside brewery. There are currently 40 barrels of Sour Brown maturing away with our house blend of lactic/pediococcus and brett culture. We predict it’ll be another six months until we can consider packaging this and then only if we’re happy with the flavour profile. However, having learnt a lot from the first batch and on tasting the second batch, we’re confident this beer will be fantastic and we’re looking forward to sharing it with you all. One of the great things about Thornbridge is the fact we’re known for being strong advocates of keg beer, but we make proper cask conditioned beer too, and always have done. This year we’ve moved back to a traditional fruity British strain from Yorkshire to really perfect our cask beer range. As a huge fan of cask in general, particularly beers like Harvey’s Best and Timothy Taylor’s Landlord, I feel that the subtleties which contribute to fantastic English cask beer are often overlooked and misunderstood by the new wave of brewers in the UK obsessed only with hops. With our second house strain now happily bedded in to complement our American ale strain, I feel as happy with our cask beers now as much as I do about our bottle and keg range. Producing so many beers, it’s difficult to think which has been our favourite to make this year. Indeed, I am often asked by other head brewers how we manage to brew such a diverse range of beers and keep the quality and consistency that we do. I think the answer lies in a very strong QA system and a great, long-standing team of excellent brewers who are genuinely passionate about the beers we brew. Anyway, I was somewhat hesitant when we began the left field project beers as I was worried they’d be perceived as a novelty. However, with careful planning and plenty of lab trials we managed to produce a cracking range of beers and received tremendous feedback for our efforts. In fact, Charlie Brown, our Peanut Butter Brown Ale was probably our fasted selling beer ever and the 5000 litres we made had left the premises in less than a week! Some of our new 100 hl tanks awaiting shipping. To be fair none of our beers stay in stock very long and despite our best efforts it is a constant frustration to never have enough beer for all our customers. However, we have embarked on a carefully planned expansion with Musk Engineering, a UK-based firm who have recently completed projects for our friends at Hall and Woodhouse Brewery and also Fyne Ales in Scotland. 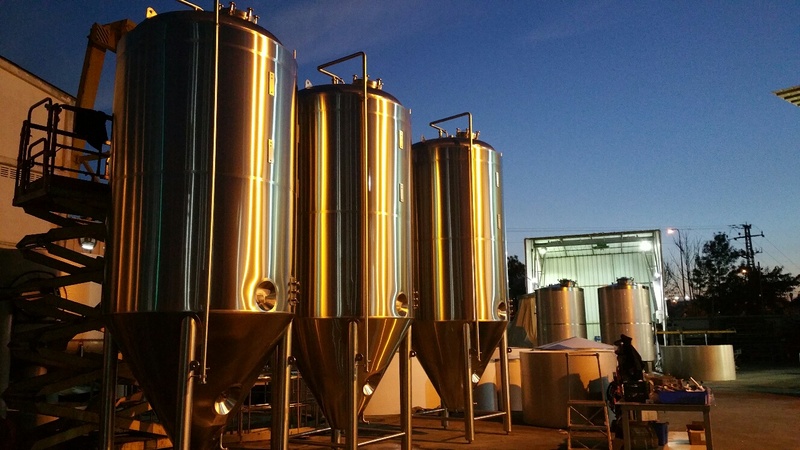 In Early January we will have 6 new 100 hectolitre cylindro-conical vessels arriving, then a month later we will be modifying our automated brewhouse and rewriting the software to enable us to mash in more frequently. This first stage of expansion will allow us to increase production while not compromising on quality in any way. This means more staff and we’ve already employed a new brewer and more brewery operatives to spread the load and I must say they’ve fitted in nicely. Before I get back to work I’d like to tell you about a few beers we’ll be making next year. We’ll be brewing a Smoked Bock in the Bamberg style using 100% Beechwood smoked malt. We’ll also be bottling our Chocolate Porter, Cocoa Wonderland, a beer we made for Sheffield Beer Festival that won Beer of the Festival and subsequently wowed the crowds everywhere it made an appearance on cask. We have a new sour beer on the way; a blonde ale made with botanicals, around 6.5% abv and aged in Tequila casks. I suppose the last thing I should tell you about is Jaipur ‘X’…2015 marks 10 incredible years of Thornbridge Brewery, and the first thing we will be doing to celebrate is brewing our most famous beer, Jaipur, as a triple IPA to 10% abv. This will be available in the New Year in kegs and bottles and marks the first of some great surprises we have in store to mark our first decade as a brewery. May I wish you all a magical and peaceful Christmas and all the best for the New Year.